For the academic journal, see The Lion and the Unicorn (journal). For the essay by George Orwell, see The Lion and the Unicorn: Socialism and the English Genius. 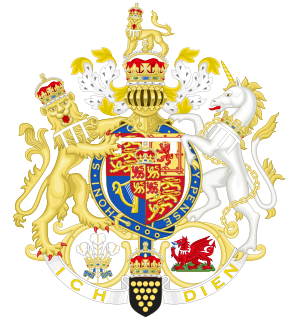 The lion and the unicorn as they appear on both versions of the Royal coat of arms of the United Kingdom. In the Scottish version (shown right) the two have switched places and both are crowned, and the lion on top is coloured red. 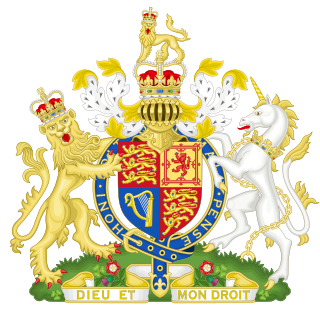 The Lion and the Unicorn are symbols of the United Kingdom. 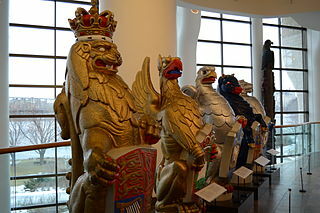 They are, properly speaking, heraldic supporters appearing in the full royal coat of arms of the United Kingdom. The lion stands for England and the unicorn for Scotland. The combination therefore dates back to the 1603 accession of James I of England who was already James VI of Scotland. By extension, they have also been used in the arms of Hanover in 1837–1866 and the arms of Canada since 1921. The Lion and the Unicorn as they appear in A Nursery Rhyme Picture Book by L. Leslie Brooke. John Tenniel's illustration for Through the Looking-Glass. This rhyme was played upon by Lewis Carroll, who incorporated the lion and the unicorn as characters in Through the Looking-Glass. Here, the crown they are fighting for belongs to the White King which, given that they are on the White side as well, makes their rivalry all the more absurd. Carroll subverts the traditional view of a lion being alert and calculating by making this particular one slow and rather stupid, although clearly the better fighter. The role of the Unicorn is likewise reversed by the fact that he sees Alice as a "monster", though he promises to start believing in her if she will believe in him. Sir John Tenniel's illustrations for the section caricature Benjamin Disraeli as the Unicorn, and William Ewart Gladstone as the Lion, alluding to the pair's frequent parliamentary battles, although there is no evidence that this was Carroll's intention. The rhyme is also the basis of an episode in the novel Stardust by Neil Gaiman, in which the protagonists of the novel, Tristran Thorn and Yvaine, witness a lion and a unicorn fight over a crown during their travels through an enchanted forest. The accompanying illustration by Charles Vess applies an Art Nouveau style to a realistic depiction of a lion attacking its prey. ^ a b c I. Opie and P. Opie, The Oxford Dictionary of Nursery Rhymes (Oxford University Press, 1951, 2nd edn., 1997), pp. 442-3. Wikimedia Commons has media related to The Lion and the Unicorn. Baker, E.D. Dragon's Breath, 162-3. New York: Bloomsbury USA Children's Books (2003). A nursery rhyme is a traditional poem or song for children in Britain and many other countries, but usage of the term only dates from the late 18th/early 19th century. The term Mother Goose rhymes is interchangeable with nursery rhymes. 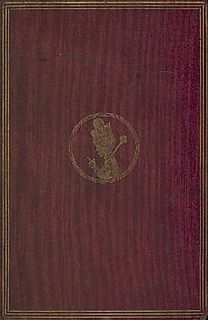 Through the Looking-Glass, and What Alice Found There (1871) is a novel by Lewis Carroll and the sequel to Alice's Adventures in Wonderland (1865). Alice again enters a fantastical world, this time by climbing through a mirror into the world that she can see beyond it. 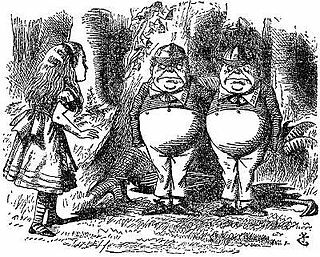 There she finds that, just like a reflection, everything is reversed, including logic Through the Looking-Glass includes such verses as "Jabberwocky" and "The Walrus and the Carpenter", and the episode involving Tweedledum and Tweedledee. The mirror which inspired Carroll remains displayed in Charlton Kings. Humpty Dumpty is a character in an English nursery rhyme, probably originally a riddle and one of the best known in the English-speaking world. He is typically portrayed as an anthropomorphic egg, though he is not explicitly described as such. 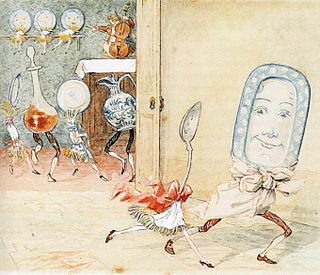 The first recorded versions of the rhyme date from late eighteenth-century England and the tune from 1870 in James William Elliott's National Nursery Rhymes and Nursery Songs. Its origins are obscure and several theories have been advanced to suggest original meanings. "London Bridge Is Falling Down" is a traditional English nursery rhyme and singing game, which is found in different versions all over the world. It deals with the depredations of London Bridge and attempts, realistic or fanciful, to repair it. It may date back to bridge rhymes and games of the Late Middle Ages, but the earliest records of the rhyme in English are from the seventeenth century. The lyrics were first printed in close to their modern form in the mid-eighteenth century and became popular, particularly in Britain and the United States during the 19th century. "Ring a Ring o' Roses" or "Ring a Ring o' Rosie" is a nursery rhyme or folksong and playground singing game. It first appeared in print in 1881, but it is reported that a version was already being sung to the current tune in the 1790s and similar rhymes are known from across Europe. It has a Roud Folk Song Index number of 7925. Urban legend says the song originally described the plague, specifically the Great Plague of London, or the Black Death, but folklorists reject this idea. 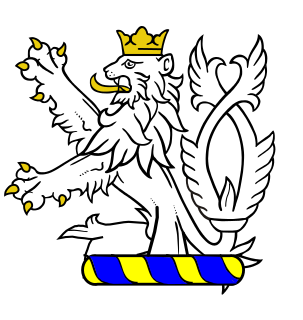 Attributed arms are Western European coats of arms given retrospectively to persons real or fictitious who died before the start of the age of heraldry in the latter half of the 12th century. Arms were assigned to the knights of the Round Table, and then to biblical figures, to Roman and Greek heroes, and to kings and popes who had not historically borne arms. Each author could attribute different arms for the same person, but the arms for major figures soon became fixed. "The Queen of Hearts" is an English poem and nursery rhyme based on the characters found on playing cards, by an anonymous author, originally published with three lesser-known stanzas, "The King of Spades", "The King of Clubs", and "The Diamond King", in the British publication the European Magazine, vol. 1, no. 4, in April 1782. However, Iona and Peter Opie have argued that there is evidence to suggest that these other stanzas were later additions to an older poem. The unicorn was a gold coin that formed part of Scottish coinage between 1484 and 1525. It was initially issued in the reign of James III with a value of 18 shillings Scots, but rising gold prices during the reign of James V caused its value to increase first to 20 shillings, and then 22. The obverse of the coin shows a crowned unicorn. The significance is that the unicorn is one of the heraldic symbols of Scotland, two of them occurring, most notably, crowned and chained, as the supporters of the royal coat of arms of Scotland.